Every year, 6 million companies and more than 100,000 products are launched. They all need an awesome name, but many (such as Xobni, Svbtle, and Doostang) look like the results of a drunken Scrabble game. 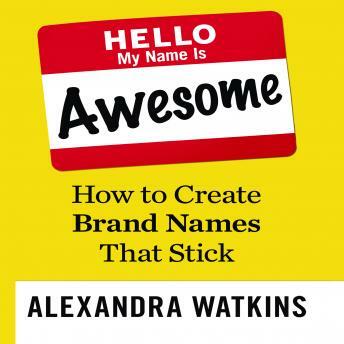 In this entertaining and engaging book, ace naming consultant Alexandra Watkins explains how anyone-even noncreative types-can create memorable and buzz-worthy brand names. No degree in linguistics required. The heart of the book is Watkins's proven SMILE and SCRATCH Test-two acronyms for what makes or breaks a name. She also provides up-to-date advice, like how to make sure that Siri spells your name correctly and how to nab an available domain name. And you'll see dozens of examples-the good, the bad, and the "so bad she gave them an award." Alexandra Watkins is not afraid to name names.